I recently had a young Optimizer ask me, “How do you turn analytics data into a hypothesis?” My answer was probably unexpected: “You don’t.” My curt answer was meant to alert this young pup that a single input isn’t enough to form the basis of a good marketing hypothesis. 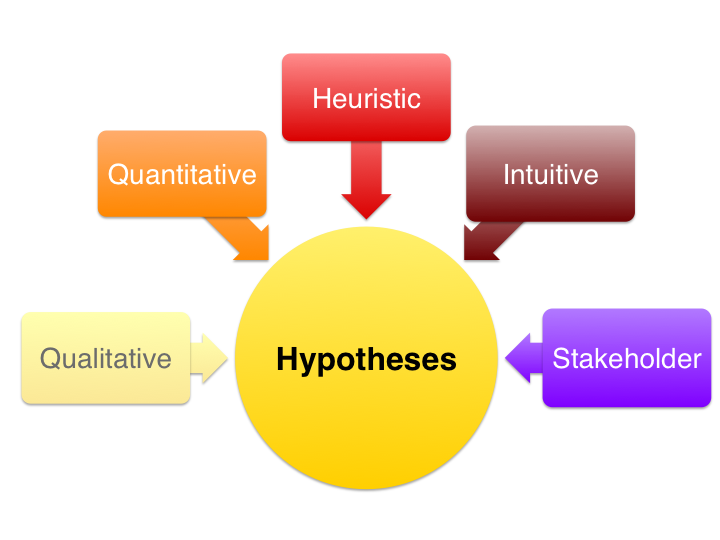 Today’s post will overview what I believe are the 5 key ingredients of a great marketing hypothesis. Plenty of posts I’ve read have instructed you how to leverage the Scientific Method to write a Conversion Optimization hypothesis. They usually instruct you to make sure it’s provable/disprovable, clearly stated, based on a specific Key Performance Indicator, etc. This is all good advice, but assuming you know all that, I want to cover the inputs. These inputs, IMO, are the difference between a legitimate hypothesis and a world class hypothesis. Some of these 5 key inputs are probably obvious, but a few may have evaded you. Or, perhaps you thought it was “uncool” to have them as inputs?